Red-billed oxpeckers squabble over prime seating on the back of an African buffalo. These birds are famous for travelling on tolerant buffalo and other mammals, feeding on various insects on their hosts or nearby. When the time comes, these birds build nests in tree cavities, which makes this photo all the more interesting. This group of birds seem to be using a rudimentary nest made out of mud and hair plucked from the back of this buffalo. This is the first time I have seen this and I haven’t been able to find any reports elsewhere, so if anyone has some insights into this behaviour, please share! 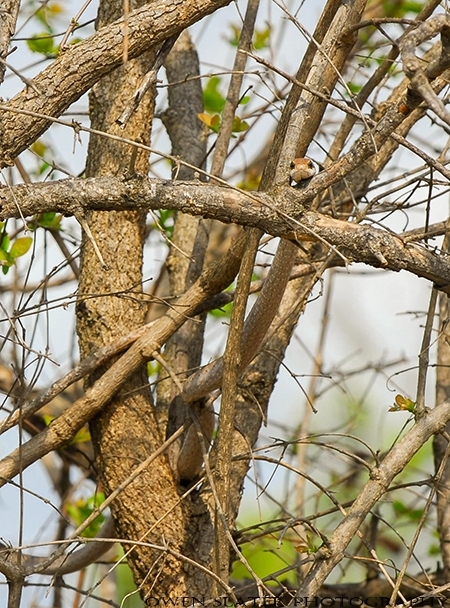 For good reason, the lilac-breasted roller is one of the most photographed birds in Eastern Africa. A stunningly colourful bird that I wanted to try to photograph in mid-flight. The hardest part was predicting the flight path, but with a bit of luck and a couple of attempts I came away with a few keepers. This honey badger got into a very prickly situation when it decided to take on a crested porcupine! Before I had time to set up my camera, the porcupine made a mad dash directly towards our vehicle. With the badger momentarily distracted by the 17 massive, foot long quills protruding from its head, neck and shoulders, the porcupine sprinted (they can run pretty fast!) around the corner and escaped. The badger tried to follow its scent, but it was too late and it retreated back into the bush. Honey badgers are known to be one the most fierce mammals around. They can withstand stings from hundreds of bees and multiple bites from highly venomous snakes. While this photo isn’t great (ISO 32000 to freeze the action in low light), I thought it was important to share since there are very few documented reports of honey badgers hunting porcupines. In fact, many state that honey badger skin is impervious to porcupine quills! While not impervious, most of the quills were not deeply embedded; a testament to just how tough and thick badger skin is. I suspect that the likely outcome will be most of these quills will fall out on their own or will be scratched or bitten out by the badger. Long term, it might develop an infection, but given how tough these animals are, I also wouldn’t be surprised if keeps on going as if nothing happened! P.S. A bonus photo clearly showing all 17 quills. Also, crested porcupine quills are much larger than North or South American porcupine quills and do not have backward facing barbs, so they don’t continue to migrate into tissues. Southern yellow-billed hornbills perched together in Kruger National Park, South Africa. We lucked out with a close up leopard encounter along a river bed in Kruger. This impressive male had killed an adult male impala earlier in the morning and dragged it over 100 meters from the edge of the river, up a steep slope and into a small stand of trees right next to a pullout. For the next few days we watched him off and on as he came back to feed in the early mornings. Such impressive animals and always a thrill to see them in the wild. A common, but never dull sighting in Kruger National Park were the numerous turtles that used hippopotami as their basking platforms. With the hippos tired out from eating all night long they mostly rested in the water during the day, which gave the opportunistic turtles a perfect platform to grab some rays. Surprisingly, the notoriously cranky hippos didn’t seem to mind the reptilian free-loaders! The extreme example of this was this dynamic duo. Not wanting to go back into the murky water, the turtle was determined to hang on while the hippo went for a stroll along the shore. I figured at some point it would either get scared and crawl off, or it would fall. However, I underestimated the determination of the turtle, who hung on and continued basking on the hippo’s back while being paraded around the watering hole! Always something new and interesting to see when watching wildlife. The crested guineafowl, with bright red eyes and the the best feather mohawk I’ve seen, is one funky bird. A flock of them visited our campsite in Kruger to take dust baths in the fine, dry soil right next to our tent. The fine dirt is perfect for getting down between the feathers and to the skin to kill off lice, as well as to remove excess oils and keeps the feathers in good condition to allow for a quick escape from predators. A face only a mother could love!? While some will say yes, warthogs more than make up for it with their personalities. This adult female was strutting her stuff on the way to the watering hole. Her appearance caught the eye of two nearby males, who quickly tried to establish which one of them was going to get the chance to talk to her. While the smaller and younger male put up a good fight and made a last ditched effort to tusk his opponent, it was the older, mud-covered male that won out. After chasing the younger male away, he walked over to the female while clattering his teeth and drooling for her attention. However, on this morning she was more interested in getting a drink than any of his advances. The male got the message and without missing a beat, he wandered off to try his luck with another female. It’s been some time since my last post to say the least. Since April I’ve travelled to Tanzania for work and then onto South Africa for a holiday before eventually coming back to Canada. It had been a few years since I had been to this wonderful part of the world so it was great to get back. For the next little while I will post some images from my experiences there. There was certainly no mistaking when this buffalo herd was nearby. Stretching for more than a kilometer, this large herd was a sight to be seen, kicking up dust with every step as they slowly made their way to one of the last remaining watering holes not dried up from the prolonged drought. Travelling along with them was their mini-ecosystem of assorted insects and birds. Equally as impressive were the sounds. The constant rumble of their hooves pounding the dirt, periodically interrupted by snorting bulls crashing through bushes in their way, bawling calves, hordes of buzzing insects and flocks of squawking ox peckers. Even when hidden from view and resting in the shade, getting downwind of them told me they had not gone far! Three adult lions were nearby, but they didn’t even bother getting up to investigate. With full stomachs and the hot sun beating down, they had no interest in testing the buffalo that day. 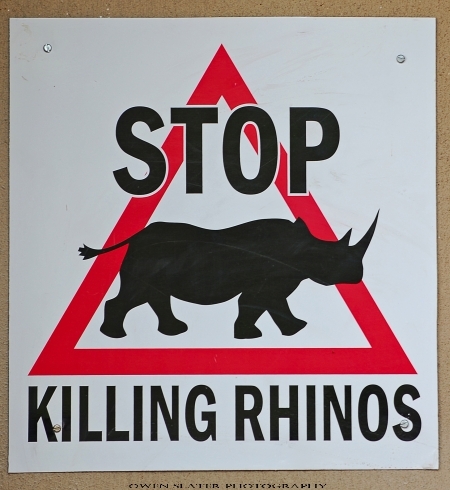 I came across this sign in Kruger National Park in November 2010. At the time rhino poaching wasn’t that prevalent. Since then, poaching has skyrocketed with almost 700 rhinos poached in Africa in 2012, most coming from Kruger. Rhino horn is valued at up to $50,000/kg in Asian markets and with prices so high sophisticated poaching operations are becoming much more common. Typically these involve helicopters, and people specialized in big game hunting. Unbelievably, even wildlife veterinarians have crossed the line and are selling ultra potent narcotics to these poachers so that the rhinos can be tranquilized in minutes. Once sedated, the horns are then cut off by chainsaws and the rhinos are left to die. The most frustrating part is that rhino horn is no different from human fingernails! It is simply keratin and so people could get the same ‘effect’ by chewing their own nails! Efforts to cut poaching have ramped up. Some game reserves are safely cutting the horns off before poachers can get to them. If done correctly, this procedure is no different from cutting the tip of a fingernail off. Other efforts include increased patrols, individual guards for animals, and some have even resorted to controversial methods such as impregnating the horns with a toxic substance that will cause harm to anyone that consumes it. Others have advocated for farming rhino for their horn, since it regrows over time. This would allow for a small amount of horn to enter the market on a routine basis that might decrease the amount of poaching. Of course educating those that consume the horn is paramount and NGOs are currently working in these regions to try to curb consumption. With any long standing problem, a multi-pronged approach is required and out of the box thinking and solutions will be needed.